This academic year, all Year 8 pupils have worked hard to complete every element of The Young Leader Award which has been written and developed by Sports Leaders UK. This award develops understanding and gives pupils the opportunity and encouragement to lead their peers in simple activities. The Young Leaders Award helps pupils to further develop important life skills such as organising, communicating and working with others, whilst increasing their personal self-confidence and self-esteem. 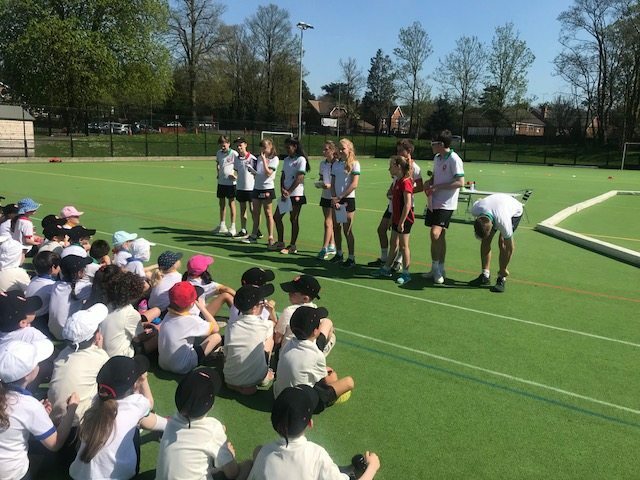 As the final part of their award, last Friday, a small group of Year 8’s took part in the first Downsend Leadership Day. The challenge was to plan, organise and deliver an activity afternoon for all the Year 2 pupils. First task was to decide what type of activity would be undertaken taking into account the following factors: 77 Year 2 pupils, 1 astro and 10 Leaders. They set about discussing the possibilities and democratically decided on a carousel of stations which would stretch skill and speed whilst maintaining a high level of fun! The less exciting paper work aspect of the organisation was the next challenge. With the group splitting into sub teams responsible for different aspects and access to the IT suite, team lists were drawn up, station instructions tabulated and individual certificates printed in a hive of activity with the tension of their first experience of real deadlines! Final task, to organise all the equipment on the astro as planned and ensure any technical and scoring issues were ironed out. The Year 2 arrived with sun hats and water bottles and were thoroughly challenged and entertained all afternoon. The well planned event ran smoothly with no hiccups and plenty of smiling children. Many congratulations to all the Year 8 who took part. They were absolutely superb with many suggesting it was the hardest afternoon they had spent in school ever!